©1993 Paramount Pictures. All rights reserved. A Kobheerian freighter arrives at the station carrying a Cardassian passenger suffering from a medical condition known as Kalla-Nohra. Upon seeing the visitor, Major Kira (Nana Visitor) immediately arrests him, citing that the only place he could have contracted Kalla-Nohra was at Gallitepp, a Bajoran forced labor camp. Though he denies the accusation, the Cardassian, tentatively identified as a teacher, is held captive while Kira investigates his background. A photograph from Bajoran archives reveals that this teacher is actually Gul Darhe'el, the "Butcher of Gallitepp." When Kira confronts him with the information, the Cardassian says it's true - but an even deeper secret remains. Vedek Winn (Louise Fletcher), a Bajoran spiritual leader, objects to Keiko's (Rosalind Chao) scientific teachings about the worm hole. 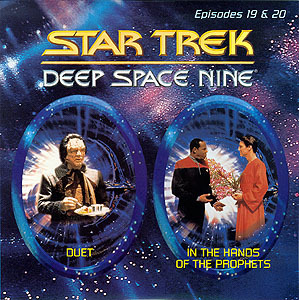 When Commander Sisko (Avery Brooks) tries to resolve the conflict, the Vedek claims Keiko has dishonored the Prophets and unless she recants there will be dire consequences. Hoping for a peaceful solution, Sisko seeks advice from Vedek Bariel (Philip Anglim), the leading candidate to become Bajor's next Kai. But when a bomb blast destroys the school, tension between the Bajorans and the Federation mounts. Meanwhile, Chief O'Brien (Colm Meaney) discovers that an important tool is missing and the Ensign who took it was murdered. Hoping for a peaceful solution, Sisko seeks advice from Vedek Bareil (Philip Anglim), the leading candidate to become Bajor's next Kai. But when a bomb blast destroys the school, tension between the Bajorans and the federation mounts. 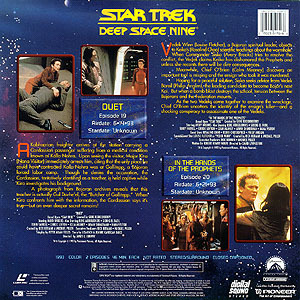 As the two Vedeks come together to examine the wreckage, O'Brien uncovers the identity of the ensign's killer - and a shocking conspiracy to assassinate one of the Vedeks.